The Duke and Duchess of Cambridge, along with Prince Harry, attended the premiere of Spectre, the new James Bond film, on Monday evening in London. Kate wore a new light blue Jenny Packham gown, but even more exciting, she wore a pair of new earrings! Well, new to her, at least. The lovely blue topaz and diamond girandole earrings were previously worn by her mother, Carole Middleton. Carole wore the earrings, which are set in white gold, with a coordinating necklace in 2011 at Kate and William's wedding reception. The earrings were made by Robinson Pelham, the same jewelry firm that made Kate's diamond wedding earrings. 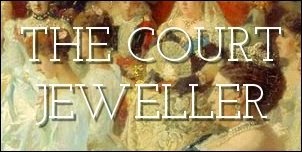 The swift ID of the earrings was made by Anna, who writes about both Kate and the Countess of Wessex. Great eye, Anna! What do you think of Kate's blue topaz earrings?